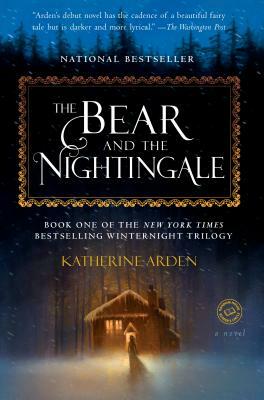 Katherine Arden’s bestselling debut novel spins an irresistible spell as it announces the arrival of a singular talent with a gorgeous voice. Winter lasts most of the year at the edge of the Russian wilderness, and in the long nights, Vasilisa and her siblings love to gather by the fire to listen to their nurse’s fairy tales. Above all, Vasya loves the story of Frost, the blue-eyed winter demon. Wise Russians fear him, for he claims unwary souls, and they honor the spirits that protect their homes from evil. Then Vasya’s widowed father brings home a new wife from Moscow. Fiercely devout, Vasya’s stepmother forbids her family from honoring their household spirits, but Vasya fears what this may bring. And indeed, misfortune begins to stalk the village. But Vasya’s stepmother only grows harsher, determined to remake the village to her liking and to groom her rebellious stepdaughter for marriage or a convent. As the village’s defenses weaken and evil from the forest creeps nearer, Vasilisa must call upon dangerous gifts she has long concealed—to protect her family from a threat sprung to life from her nurse’s most frightening tales. Born in Austin, Texas, Katherine Arden spent a year of high school in Rennes, France. Following her acceptance to Middlebury College in Vermont, she deferred enrollment for a year in order to live and study in Moscow. At Middlebury, she specialized in French and Russian literature. After receiving her BA, she moved to Maui, Hawaii, working every kind of odd job imaginable, from grant writing and making crêpes to guiding horse trips. Currently she lives in Vermont, but really, you never know.